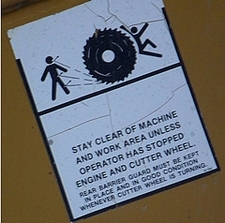 Here is list of strange warning labels wihich I found amusing which I thought I would share with you. My favourite is the Hair Coloring whats yours? Hair straightener: This product contains lead. Wash all areas that come in contact with handle or cord immediately after use. Sunscreen for my windshield: Do not operate vehicle while screen is in place. Lava lamp: Ingestion of alcohol and/or drugs will NOT make the lava lamp appear more psychedelic. Instead, your head will explode. The reason for this one: Hairdryer: Do not operate while asleep is because, apparently, there are people out there actually sleep with their dryers going. I didn’t know this was a thing until I caught the episode of My Strange Addiction featuring a woman who couldn’t sleep without having a dryer in her bed. She would literally fall asleep with it blowing hot air on her bare skin. Of course, the doctor strongly urged her to stop at once, telling her she was either going to severely burn herself or catch the whole infernal bed on fire. I don’t know if she heeded his warning or not. What I DO know is that you can’t fix stupid, so confidence is not high… But anyway, that’s the reason behind the that particular face-palm-worthy bit o’ caution.